Detail of Hirschland crest atop the Villa door. 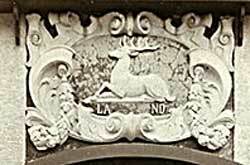 This crest was also at Franz Hirschland’s house in Harrison, NY. thanks to Laura & Anne for allowing us to use it. When Marcus Hirschland, who was the owner of one of the most popular Department Stores in nearby Mannheim, built himself and his family a vacation home near Schriesheim, Germany, in 1903, who would have known that it would be in the news more than 100 years later. 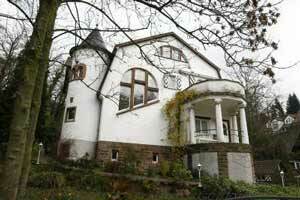 But when M. Hirschland found mention of the Hirschland Villa, he forwarded it to me for follow up. Original Article in translation.